Synopsis : May 2012. India is hit by a series of freak weather disturbances and startling epidemics that threaten to bring the country to its knees. At the same time, children are disappearing from the slums in the capital and nobody seems to care. Stumbling upon these strange and seemingly unrelated incidents, journalist Chandrasekhar, historian Meenakshi Pirzada and intelligence operative Syed Ali Hassan start upon a trail that leads them into the drawing rooms of Delhi’s glittering high society before reaching a terrifying climax in Bhutan, where they come face-to-face with a force of unspeakable power and evil. 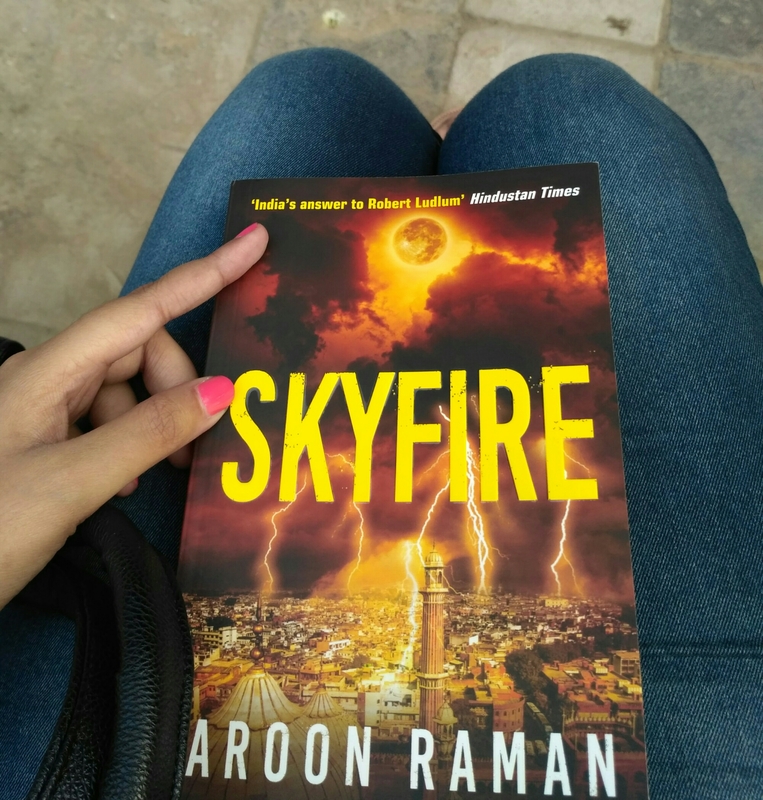 Bestselling author Aroon Raman’s third novel, Skyfire, is a heart-stopping thriller that will chill you to the bone. My view : Amidst the waves of murder mysteries, Skyfire is like a fresh change of wind in the mystery genre. It is the kind of book I would recommend to all my friends and may be even lend it to them. Although I have not read the other two books of the author but his third book is a compelling and engaging must-read of the year 2016. The book has two simultaneously progressing plots that are equally engrossing. Journalist Chandrasekhar and Meenakshi, the college professor of history are puzzled by the sudden disappearance of an orphan Gopal. Gopal and the other kids of the slum are vanishing one by one and no one has any clue about the on-goings. Intelligence Officer Syed Ali Hasan, who is fond of the young kid Gopal, tries his best to extend his resources and help Chandrasekhar and Meenakshi in locating the children but he is kept busy with a complicated case. On the other hand, freak weather accidents are shocking the scientists and meteorologists all over the continent. Sudden storms and acidic precipitation are killing thousands of people throughout India. In spite of desperate measures, authorities are unable to prevent the disaster. Will Hasan be able to affect the consequences of this Skyfire? Are the missing children and strange storms anyhow related? Aroon Raman’s expertise in various fields such as medicine, meteorology, social work, etc. is marvelous. He weaves such accurate facts into a fictional tale that it is brilliant. However, not once through the read will you feel bamboozled by difficult concepts or overload of information. Raman makes it all easy and clear through his simplistic style of writing. Since I have not read The Shadow Throne, the three protagonist characters were newly introduced to me and may I add, I am in love with each of them. The characterization by the author is deep and intricate and you can’t help but empathize with them. I am looking forward to reading the second book too. The only thing that upset me was the predictability of the climax but then again, may be I have got a super brain and I was able to guess the ending correctly. Other than this, I have absolutely no complaints regarding this novel. If you haven’t read this book yet then you definitely need to pick it up immediately. Aroon Raman is one of those authors who are reshaping the path of contemporary works in mysteries and fiction. Kudos to that!